Diesel motors have never really caught on in motorcycles: most have abysmal power-to-weight ratios. But the German company Sommer has been plugging away with its Royal Enfield-based machines, and proudly claims to be Europe’s #1 diesel motorcycle manufacturer. 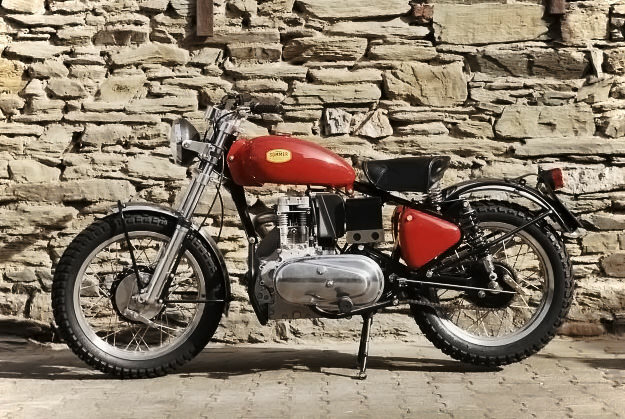 In India, similar Enfield Bullets were available with an anaemic 325 cc diesel, but Sommer uses a perkier 462 cc motor pumping out a respectable 26 Nm (19 lb ft) of torque at just 2000 rpm. (To put that into perspective, it’s equivalent to a typical 250 petrol bike.) The Sommer 462 can just about do the ton, and uses just 2.5l of fuel per 100km. We like the look of the Scrambler variant in the photo, but it’s nothing compared to the turbocharged, intercooled Track T-800CDI. With a modern chassis and styling—and 130 Nm of torque on call—Track will probably put Sommer’s #1 claim to the sword pretty quick.